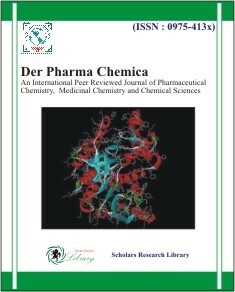 We would like to invite you to contribute in the journal Der Pharma Chemica at the www.derpharmachemica.com website. It will maintain a rapid editorial procedure and a rigorous peer-review system. 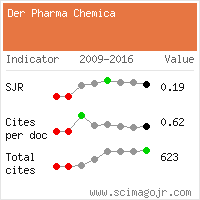 Because it is an open access journal, papers published in Der Pharma Chemica will receive very high publicity. We would like to invite you to contribute papers for consideration and publication in Der Pharma Chemica. We invite advanced methodologies and strategies applied in your research experiences in the fields of Chemistry, Pharmaceutical Chemistry and Medicinal Chemistry for the present generation which will help the young researchers as their valuable references for publication in Der Pharma Chemica. Your genuine research work are cordially inviting for our successful publication of successive editions. You can refer the below provided Authors Guidelines for the format of the manuscript. We would like to invite you to contribute in the journal Der Pharma Chemica as member of our honorary Editorial/Advisory Board. It is essential for us that authors should prepare their manuscripts according to the instructions and specifications listed below. The length and effectiveness of the peer review process will largely depend upon the care used by authors in preparing their manuscripts. Therefore, contributors are strongly encouraged to read these instructions carefully before preparing a manuscript for submission, and to check the manuscript for conformance before submitting it for publication. Page format : Manuscripts should be prepared as word processing documents on A4, or Letter size paper, leaving a liberal margin (2 cm) on all four sides. The manuscript should be typed double-spaced throughout (with a space of 24 points , that is, 6 mm, between lines) including references and tables. Fonts : Serif fonts such as Times, Times New Roman and point size should be 12. Tables: Tables should be numbered consecutively using Arabi c. Each table should have an explanatory caption which should be as concise as possible. The title should be relatively short but informative. A list of all authors of the paper should be prepared. It will contain full first name, initial(s) for middle name(s) and full last name. Authors’ affiliations should be indicated in this section. At least one e-mail address is needed as the corresponding author’s email address. An abstract must accompany every article. It should be a brief summary of the significant items of the main paper. An abstract should give concise information about the content of the core idea of your paper. It should be informative and not only present the general scope of the paper but also indicate the main results and conclusions. An abstract should not normally exceed 250 words. List of all keywords proposed by the authors, separated by commas. Up to 5 key terms can be selected. Present the subject of paper clearly, indicate the scope of the subject, present the goals of paper, novelty of research work and finally the organizati on of paper. ssion from animal ethical committee should be mentioned. The source of chemicals and drugs may be given. It may be combined or kept separate and may be further divided into subsections. This section should not contain technical details. It should be representing the summary of the import ant findings. Information concerning research grant support, assistance of colleagues or any other notes of appreciation should appear in this section. Author's Initials Surname, journal, year, volume, issue, page no. H. Li, J. Kim, L. Groy, J. Am. Chem. Soc., 2001, 123, 4867. Author's Initials. Surname, Title, Publisher, Place of publication, Year of publication, Edition, page no. C.N.Rao, A. Muller, A. K. Cheetham; The Chemistry on Nanomaterials. Synthesis, Properties and Applications, Wiley-Vch, Weinheim, 2004, 1, 115. Author's Initials. Surname, In: Editor’s Initials. Editor’s Surname (Ed. ), Book Title, Edition -- if not the first, (Publisher, Place of publication, Year of publication) page number. C.K. Clenshaw, K. Lord, In: B.K. P. Scaife (Ed. ), Studies in Numerical Analysis (Academic Press, London and New York, 1974) 95. Author's Initials. Surname, In: Editor’s Initials. Editor’s Surname (Ed. ), Conference, date, place (town and country) of conference (Publisher, place of publication, year of publication) page number. A. Kaczanowski, K. Malarz, K. Kulakowski, In: T.E. Simos (Ed. ), International Conference of Computational Methods in Science and Engineering, 12-16 Sep . 2003, Kastoria, Greece (World Scientific, Singapore 2003) 258. Author's Initials. Surname, DSc/PhD/MSc/BSc thesis, University, (town, country, year of publication). A.J. Agutter, PhD thesis, Edinburgh University (Edinburgh, UK, 1995). Name of potential referees with contact details (if any).